The Douglas DC-3 is probably the best known of all transport aircraft in the history. It was developed from the DC-2 transport, and flew for the first time late in 1935. The reason for developing the DC-3 was that American Airlines wanted an aircraft with better sleeping facilities for their “night sleeper” services. The aircraft was known as the DST, meaning Douglas Sleeper Transport accommodating 14 sleeping berths + a honeymoon suite behind the cockpit. Compared to the DC-2 the DST was 3 inches deeper and 26 inches wider, length almost three feet longer and span was increased by 10 feet. The take- off weight was increased from 18.000 lbs. to 24.000 lbs. and the engines each got an extra 180 hp. However the need for the DST was very limited and only 38 were built. The DST was also produced as a normal airliner, and the larger fuselage gave a 50 % increase in number of passengers compared to the DC-2. Up to the outbreak of WWII 455 DC-3 were built, and it was the most used airliner of its time worldwide, a real great success! WWII meant that the armed forces needed transport planes, and it was obvious to modify the DC-3 airliner to a military transport aircraft. Most important was a reinforcement of the floor and the built in of a a large cargo door in the port side of the fuselage. The C-47 was the designation of the military DC-3, other designations were: C-48, C-49, C-50, C-51, C-52, C-53, C-117 and R4D for the US Navy and Marine Corps. The RAF called the aircraft Dakota, an acronym for DACoTA – Douglas Aircraft Company Transport Aircraft, and the Russian variant was called Lisunov Li -2. Almost 5.000 Li-2 aircraft were license-built in the Soviet Union. The C-47 and other variants were produced in huge numbers – more than 10.000 and they were used in every theatre of the war. During the invasion in Normandy in 1944 large numbers of paratroopers were dropped from thousands of C-53 Skytrooper. The military DC-3 was the true work horse of WWII. The C-47 played a major role in the airlift to Berlin in 1948 - 1949. And during the Vietnam War some C-47 aircraft were modified as gunships housing three mini-guns with large amounts of ammunition for fire support, the AC-47 variant. The C-47 was sold to almost every air force of importance in the world. In Scandinavia the Norwegian air force operated 20 aircraft, Finland 9, Denmark 8, and Sweden 8. 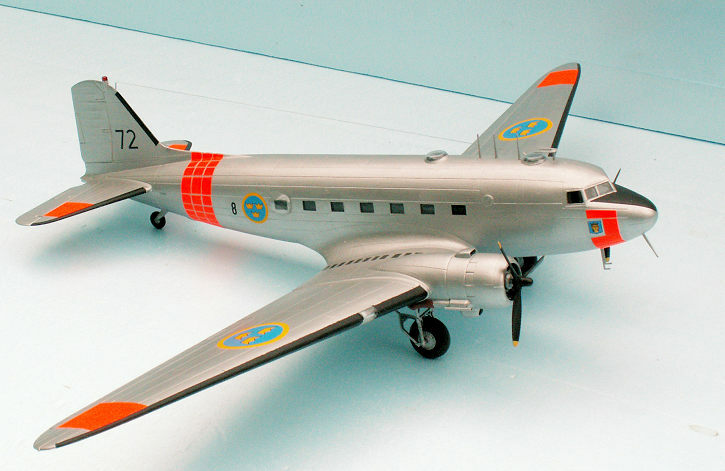 The Swedish aircraft were in service with Flygvapnet from 1947 and to 1984 – 37 years. They had the designation Tp 79, and the AF serials were from 79001 and to 79008. The 79001 named Hugin and the 79002 named Munin were both used on SIGINT missions using equipment supplied by the CIA. The spying missions were against the military installations of the Soviet Union in the Baltic area. Hugin and Munin are the names of the ravens of the old Nordic god Odin, who had the same importance for the Vikings as Zeus had in ancient Greece. The ravens would fly out and report to Odin, what they had seen and heard. Hugin and Munin are very well chosen names for spy-planes in Scandinavia! The Russians were very well aware of the existence of the two planes and the purpose of their missions. On June 13 1952 the Hugin disappeared during a mission over the Baltic. The Swedes suspected the Russians to have shot down the plane, but they had no proof. However, on the following day when a Catalina was searching the Baltic for survivors from the Hugin, this plane was shot down by a Soviet MiG 15 fighter. This incident was seen and heard on board a German merchant vessel, the Münsterland, and the Catalina crashed in the sea rather close to the ship. The crew of the Münsterland immediately launched a couple of boats, and they saved the Swedish crew just before their aircraft went down. In 1956 the Soviet leader Nikita Chrusjtjov during a meeting with the Swedish Prime - Minister Tage Erlander admitted, that Soviet fighters had shot down the Tp 79. However this information was kept secret to the public. It took another 35 years – after the collapse of the Soviet Union – before Russia in 1991 made an official announcement approved by President Boris Yeltsin, saying, that the Swedish plane had been shot down by a Soviet MiG 15 fighter. (My earlier story of the incident in my Tp 47 Catalina review states wrongly, that the meeting between NC an TE took place in 1991). In 2003 the wreck of the Hugin was found at a depth of 125 m in the Baltic. In the autumn of 2003 the wings were salvaged and brought to Muskö for further investigation. In March 2004 the fuselage and the rest of the wreck was salvaged by the Swedish Navy and brought to Muskö. Holes from the armament of a MiG 15 were found and the remnants of three crew members. The pilot had already been found. The “Catalina-affair” was a very unpleasant experience for Flygvapnet and Sweden. In order not to forget what happened in 1952, the wreck of the Tp 79 Hugin is on permanent exhibition in the Flygvapen Museum at Malmslätt. The other spy-plane is preserved and on permanent exhibition outside the Parachuting School at Karlsborg. This aircraft is the subject of my model as it looked in the early sixties. After the introduction of the Tp 52 Canberra, the Munin was no longer used on SIGINT missions, but was used as a test plane with some non-standard modifications, in particular different noses and antennas. It ended its career as a normal transport plane, but with a small Catalina blister covering the rear window in the starboard side, just as the Hugin also had. The kit – released in 1979 – comes in a nice box with an R4D of the US Navy on the lid. There are two large sprues in grey-green styrene and a small one with the clear parts, canopy, windows and landing light coverings. The parts are neatly moulded and fit very well together with the exception of part 59 – the tail piece. The landing light glazing is not symmetrical as seen from the sides. However, this problem is easily solved when painting them. There are no rivets, in return a lot of recessed panel lines showing most of the plating of the aircraft. The old Airfix kit was covered with rivets as was the fashion in the sixties. However, the fashion of the late seventies seems to be recessed panel lines – and a lot of them! As with rivets, panel lines may also be overdone. I think both ways of overdoing the details are wrong. However, it is easier sanding rivets away than filling and sanding all the panel lines. Therefore I prefer the rivets! The outer dimensions of the model are correct within one mm, and the scale is very accurately 1/72! However, the fuselage seemed to me to be too narrow as seen from above. This might be because I am used to the look of the ancient Airfix C-47, which I built 50 years ago. I have studied all my photos very thoroughly, and I found nothing to suggest, that the fuselage of the Italaerei kit is too narrow. The model is a very true replica of the real thing! Only the shape of the windows does not correspond to what I see on my photos. They are a bit too low, and too long. They should be 5.8 x 4.4 mm according to my photos. However, they are 6.0 x 4.1 mm. The windows are some 7.5 % too low. Imagine if the length of the fuselage was 7.5 % too short: the fuselage would be 2 cm too short, and this is rather noticeable! I had the same problem with the NC 701 Martinet, but in this case the error was one mm, 3 mm in-stead of 4mm, a 33 % error! I decided not to do anything about the dimensions of the windows of the C-47. Most people would not notice the error. The very similar ESCI kit does not have this error. The instructions consists of 8 A5 pages to fold out. Pages 1 and 8 contains a very short story of the C-47 and its technical data in four languages: Italian, English, German and French. Page 2 shows the sprue layout. Pages 3-5 show how to put the model together in 5 steps and exploded sketches. Pages 6-7 show how to paint and decal the two options of the kit: A US Navy R4D from 1951, and A RAF Dakota mk. III 1944 with invasion stripes. The decals seem to be first class quality, in perfect register and correct colors. The C-47 is an easy build. However, I made an error during the construction: The assembly pins and holes of the tail planes are placed in a way that makes it possible to marry a port half to a starboard half. And I did so, because I assumed that if two parts fit together, then the assembly would be right. I realized my mistake when the tail planes should be glued to the fuselage. It was not possible, because one of the tail planes had no locating tab, and the other had a tab, which was far too thick! The best solution to this stupid problem was to split the tail planes with a sharp knife and glue them correctly together again. Fortunately I had been a little miserly with the glue, and it was therefore possible to split the tail planes without mishaps. I wondered, why Italaerei did not foresee this problem, by placing the assembly pins and holes of the tail planes in a way to make the assembly fool-proof! I had decided not to anything to correct the windows of the cabin, and they were glued in place and secured by a layer of clear gloss aqua varnish before the fuselage halves were glued together. I did not do anything to detail the interior, as nothing of this can be seen from the outside on the finished model. It would be a waste of time and effort! 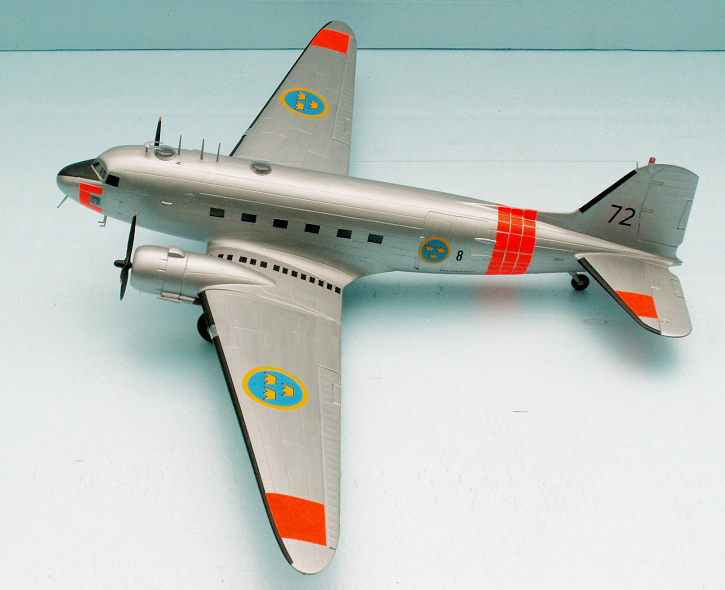 The Tp 79 is not a standard C-47, as the Swedes always modify their aircraft to the needs of Flygvapnet. The most spectacular difference would be the small “Catalina” blister covering the rear window in the starboard side. I had some spare blisters from my Tp 47 Catalina build, see here how I made them. On the dorsal there are two flat-top astrodomes of the same type as on the Tp 83 Pembroke, see here. However, I did not have any of these in my stocks, and I had to produce these. The master was made on the lathe from a piece of 8 mm gauge acryl rod. The height of the dome is max. 2.5 mm in the sides, and close to 2 mm in the middle. It was a piece of cake to form the domes from heated acetate. And the domes were punched from the work-piece with a 9 mm gauge punch. The undercarriage legs have some weak points and must be separated from the sprue very carefully. However, I succeeded in breaking one of the legs. It was glued together, and the weak points got some extra glue for strengthening the construction. In this case a metal undercarriage from the after market might be a good idea to avoid any mishaps during hard landings! It was an easy job to assemble the airframe and filling was only moderately necessary. The beacon on the top of the fin was made of the sprue from the clear parts. The gauge was right and the only problem was to file and sand a slot matching the shape of the top of the fin. The beacon was rounded in the top and colored by a transparent red CD marking pen. The color scheme of the Tp 79 is rather simple: aluminum all over, day-glow areas on the wings, tail planes and on the fuselage: a band under the cockpit and a band in front of the fin. There are flat black anti-icing devices on the front of the wings, tail planes and fin, and an anti-glare area on the top of the nose. The airframe got two layers of Revell Eisen metallic Aqua as grounding, and two layers of Revell aluminium metallic Aqua. It is important to stir these metallic colors well before use, and it was necessary to thin with Revell Aqua thinner to make the paint flow properly from the brush. Revell’s colors are drying very quickly, and therefore the paint must be rather thin. It might be necessary with an extra layer, but this is actually a cheap way of getting a nice and smooth finish. The anti-icing areas were carefully masked, and got two layers of Testors Engine black watercolor. After the first layer I noticed a micro-cracking of the black paint: It was quite noticeable for my minus five eyes at a distance of 20 cm, but it was not visible at a normal viewing distance of 50 cm. Did Testors aqua paint not go with Revell’s Aqua colors? I thought that a second layer would solve the problem. However, it did not! Since the cracking was invisible at a normal viewing distance, I decided not to do anything about it. The propellers are flat black with yellow tips. The wheel wells are US interior green, HB 226. The problem might not have occurred, if I had used a Revell aqua color for the flat black anti-icing devices. This must be tested next time I do a C-47! Water based colors are apparently not the same. Some additives for better flowing or quicker drying may cause the difference. On the Revell Aqua packing there is a label with a note in four languages saying: “May cause allergic reaction”. And maybe the cracking of foreign aqua paints? The day-glow areas should be done in different ways. On the wings and tail planes a careful masking was done, and the areas got three times of Testors Reefer white, and five times of Testors day-glow orange. The masking was removed and some light touch up was done, where the paint had crept under the masking tape into the aluminum finish. Now I had sufficient day-glow decal paper for bands of the Tp 79. I started with the nose band as this was the smallest task. Every stripe of day-glow should be measured carefully and then cut out with a sharp scalpel. Before the day-glow decaling, I placed the squadron badge of F 8, a St. Erik head. St. Erik is the guardian saint of the City of Stockholm, because Flygflotilj Svea, the official name of the F 8, was based at Barkaby air base a little north of Stockholm. It was a major problem that the painted decal paper was rather thick and far less flexible than normal decal paper. However, the paper was cut in small pieces, and for the nose band it was not too difficult to apply. Only in one place a corner of a decal would not adhere to the fuselage. This problem was solved by a small amount of clear aqua varnish, which actually was used in a wall paper glue manner. The band around the after fuselage was rather difficult to make, because it consisted of 69 pieces of decal paper, each of which carefully measured, cut and applied. I worked intensively for about 6 hours before the result was satisfactory. The distance between the single pieces of the band should be about 0.5 mm. The band was sealed by clear aqua varnish, and got a layer of satin cote to get the same finish as the aluminum airframe. Of course it would have been very much easier just to paint the two bands. But I think it was well worth the effort to make the day-glow bands look right! At this stage I realized that the color of the day-glow areas on the wings and tail planes was not matching the colors of the day-glow bands! I had to mask these areas again, and painted them twice with the fire-orange I had used for the decal paper. At first I made a test to see, if enamel paint could be applied on aqua painted areas. The test showed no problems at all, and all day-glow areas now had exactly the same shade of day-glow. Decaling the model was no problem, if you have the required decals in your stock. The national insignia with the three yellow crowns come from Flying Colors Aero-Decal sheet no 72001 d. These decals are the best obtainable for Flygvapnet aircraft. 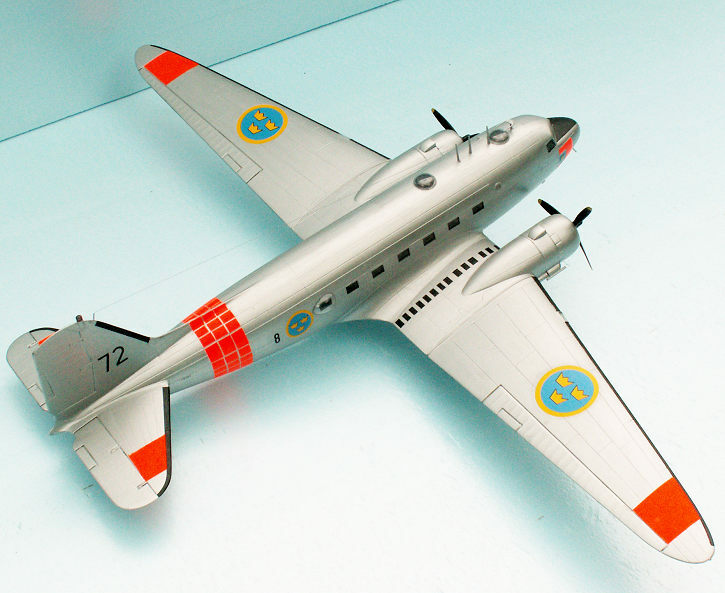 The wing number – 8 – was also from a Flying colors sheet: no 72010 Swedish AF numerals (thick) 1955-63. The large numbers on the fin “72” come from FC sheet no 72002, modern Swedish numerals in black (with 9 different sizes!). The number 72 is the first and the last numeral of the Flygvapen serial number. Later on the fin numbering system was switched to the first two and the last number of the serial number: in this case 792. The Munin is exhibited at Karlsborg with a 792 marking on the fin. The only decaling problem was the very small serial numbers on the after fuselage. They were taken from the J-26 Mustang sheet from RBD. Serial number 26009 was rather convenient for the purpose, and the missing “7” was taken from the spare numerals. The J-26 Mustang sheet has 10 different J-26 serials, and if this is not sufficient for you, there are two sets of spare numerals, which will allow you to model any of the Swedish Mustangs – 161 planes! Swedish serial numbers are always rather difficult to apply, since they are only one mm high, especially if you have to build up the number from single numerals. The anti-skid panes on the inner wings were drawn with black china-ink on a piece of clear decal paper. And after a layer of clear varnish (must be enamel!) to seal the china-ink had dried thoroughly, the anti-skid walk ways were cut out and applied without any problems. The easiest way of drawing the walkways is to draw the panes minimum 10 mm broad using a ruler. This gives sufficient room to cut two stripes, each 4 mm broad, and the side edges of each pane will be absolutely perpendicular and sharp. Left were only the small details, the antennas. There were two types: a “horseshoe” antenna and four pointed rod antennas. I found the horseshoe that came with the kit, too bad, and I made a new one from 0.4 mm plastic card and 0.3 mm brass wire bent for the horseshoe, and 1.0 mm wire for the support. There were two rod antennas with the kit, and they were sanded pointed. The two missing w ere made from stretched sprue. One of the rod antennas is on the underside of the nose and pointing a bit forward. The exhausts of the engines got 1 mm brass tubes with forward openings drilled to gauge 0.7 mm. I guess these tubes might have a useful air- cooling effect of the exhaust systems, but I don’t know for sure. The very last detail was the antenna wire between the fin and the dorsal at the front astrodome. The wire is 0.1 mm gauge, and it was fixed in small bits of 0.5 mm brass tubing, the hole is 0.3 mm gauge. A simple knot will lock the wire in the end of the tubes. Two 0.5 mm holes were drilled on top of the fin and 5 mm to the left of the front astrodome. The tubes could be glued in the holes with super glue, and if the knots are made at the right places on the wire, the antenna will be as if it was drawn along a ruler between the two fixing points. The very thin wire is fragile, and the problem is, that you tend to forget it, when handling the model, because it is almost invisible! 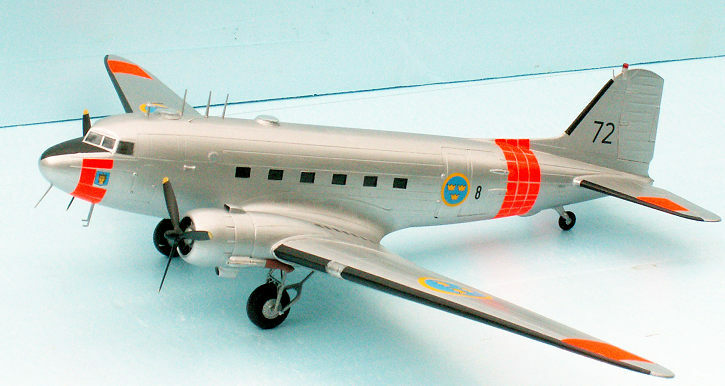 It was a genuine challenge to build the Swedish Tp 79 Dakota. It is a very fine kit, and everybody, who takes an interest in this famous military transport plane will be able to produce a good looking model from the kit. It is warmly recommended for beginners as well as more experienced aircraft modelers. The C-47 was also called C-48, C-53 and C-117, and even more. If you are not American or British, there is a challenge to build a C-47 of your own air force. There are lots of different decal sheets on the after-market, and most likely also one to be applied for your special model. 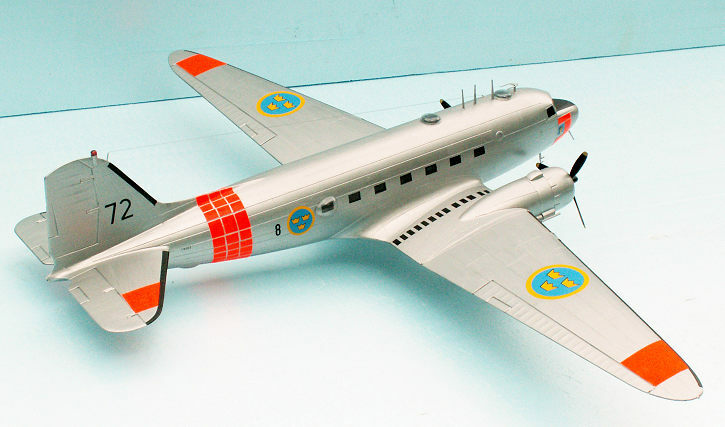 Björn karlström: Flygplansritningar 5 – Swedish AF Transport Aircraft 1926-63 in scale 1:50, 1:72 and 1:144. This book contains a scale drawing of the 79002 1/144 + 12 fine photos of most of the Tp 79, including the Hugin and the Munin. Book on Flygvapnet with about 500 Photos of first class quality. The book is a must for Flygvapnet modelers. Description of the development of the DC-3 from the DST.